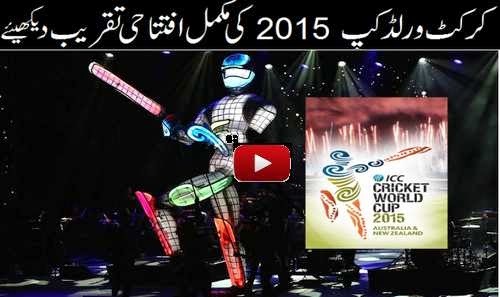 ICC Cricket World Cup 2015 opening ceremonies are held in both Australia and New Zealand. ICC Cricket World Cup is being held in Australia and New Zealand for the first time in 23 years. Opening ceremonies took place in both countries first in Christchurch and then in Melbourne. A party, performances by some of New Zealand’s top musical acts and one of the biggest fireworks displays ever hosted in Christchurch will close out the momentous event. Glenbrae Celtic Dancers and City of Melbourne Highland Pipe Band introduce Scotland. Nathaniel performs on stage during the opening ceremony. Gandhi Creations introduce the UAE. Jhoom Bollywood introduce India. With music portraying his beating heart, the 150kg cricketer took the audience on a journey from the dressing room to the crease. Before that, indigenous performers, Scottish pipers, Bollywood dancers, a South African gumboot dancing duo and a British ballet performance set to a Beatles concerto paid tribute to every nation competing. Daryl Braithwaite sang Howzat, Jessica Mauboy warbled Can I Get a Moment? and Tina Arena belted out Heaven Help my Heart.